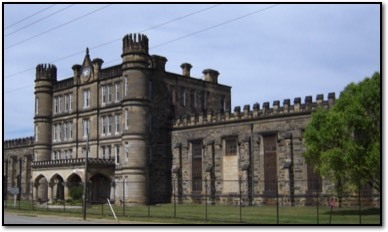 The West Virginia State Penitentiary in Moundsville, WV is one of the most insane and fun places I've investigated. It is a huge place with so many places to explore, such as the cafeteria where a bloody riot broke out, and the sugar shack, where gambling, fights and rapes occurred. However it was in one of the cell blocks where a notorious white supremacist was killed in his cell where I had one of two incredibly creepy encounters. Here my friend Laurie Hull and I were using the Echovox app on my iPad. I decided to leave it with her at one end of the block while I walked down to the cell where the man was killed. When I reached the cell a terrible slur came over the Echovox! Below is a recording both from the app, and a second on my Olympus handheld recorder as I stood in the cell. In the same cell block, just on the second floor, Laurie and I were walking around when we heard what sounded like a death moan. Visit the Penitentiary in WV.